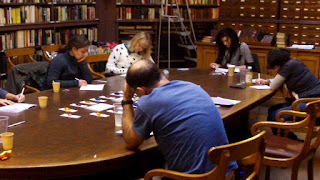 A Writing Marathon is a non-stop four-hour workshop consisting of set timed “rounds” of writing followed by read-backs of work produced. Many participants go on to develop work generated in marathons for performance at spoken word events - including Poetry Slams - or submit pieces for publication. Writing materials, food (savouries, cakes, fruit, crisps, etc) and liquid refreshment provided. Limited to ten participants per day. Cost: £20.00 per person. Interested? For details of the next Writing Marathon and to reserve a place message Steve Urwin. "A brilliant event and one of my favourite writing experiences.